Yesterday’s City Wall Stakes was a fascinating race to watch from many perspectives, and well worth a second look for as long as the video link here holds good. 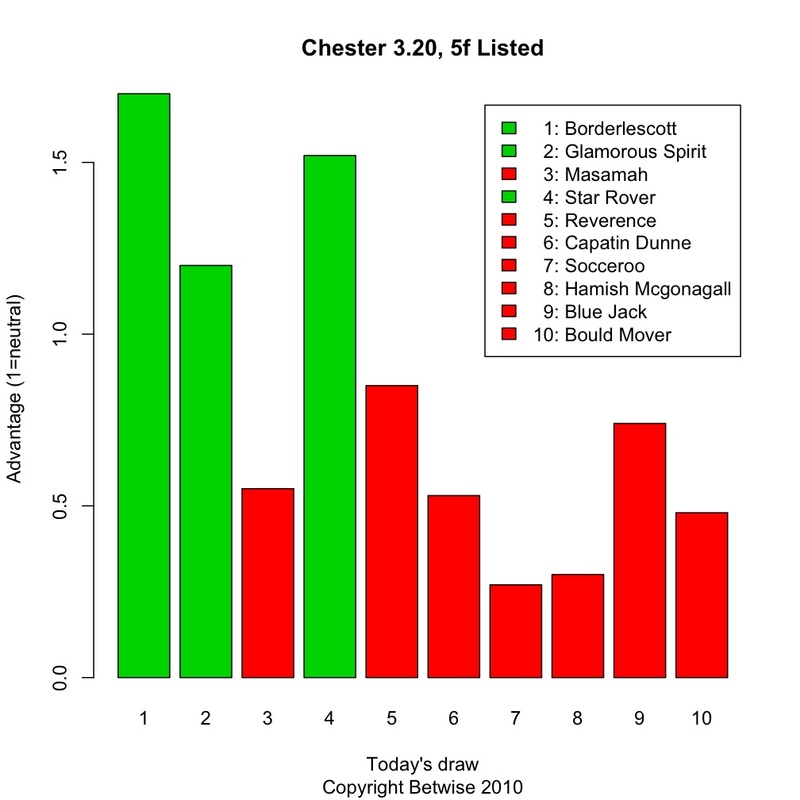 We wrote beforehand about the draw statistics at Chester, which were completely against the eventual winner, Blue Jack, drawn in stall 9. Our favoured runners were drawn 1 and 2, with Glamorous Spirit, in stall 2, the best previous front runner in the race and therefore predicted to lead early. The prediction was right – Glamorous Spirit set off at a furious pace and quickly led towards the inside rail. However, the pace was indeed furious. Glamorous Spirit must be one of the fastest breaking horses in training. She was also our front-running prediction in the Epsom Dash a few weeks back, when drawn on the unfavoured inside rail there – indeed she did break best, but her poor draw meant her race was quickly over. Chester, our favourite course for demonstrating the effect of the draw, plays host to a nice listed contest over 5 furlongs today in the 3.20. Some very nice sprinters on display here, but how well will they be able to show their ability? At Chester, more than anywhere else, the inside rail is always the place to be. We’ve written about this well known bias on a number of other occasions, especially in terms of spotting front runners whose superior early speed can get them to the inside rail spot early. In Racing Ahead this month, we go further by quantifing the draw effect in general, to give punters a handle on exactly what advantage there is. Combined with front runner ratings over at the Betwise members’ area, the draw often presents the best chance of understanding what will influence the race outcome most over the minimum distance – outside a horse’s natural ability and form. Whilst stall 1 (against the inside rail) comes out best over field sizes of 10, the advantage is not as pronounced as in larger fields, and, ability aside, does not reflect the current price differential between Borderlescott and Glamorous Spirit, drawn just to its outside. Now, which of the two has a better chance of breaking early? Head over to the Betwise Members’ area and find out. With the most interesting race of the day, the Epsom Derby, set to go off at 4 pm, we turn out attention to front runner analysis in a couple of the earlier sprints being run before the big race. This continues June’s Saturday analysis theme using our Smartform model as outlined in this month’s Racing Ahead article and previous posts. A tie for top ranked front runner does not look too promising, but the third rated, Singapore Lilly, rates only 12% likely to lead and likelier to start slowly, leaving Premier Clarets rated fourth, also at 12%. So as a starting point, we can say there is stronger than 50% chance that Dubawi Gold and Where’s Romeo will break and try to lead early. Of the two, Where’s Romeo has raced twice over the minimum trip and led, whereas Dubawi Gold has raced once over 6 furlongs and led – so, Where’s Romeo’s early speed may be stronger. Also, Where’s Romeo is drawn towards the inside rail, which is generally an advantage over 6 furlongs at Epsom. Last but not least, there is better price margin in Where’s Romeo’s price for an in-running play. Currently available at 8.2 on Betfair, we’d expect it to trade much lower if has been leading after the first few furlongs. Too many form and ability unknowns to try and call the winner, however. Next up, the top two from the Musselburgh 2.35. All the caveats on race type mentioned above apply, since it is also a 2 year old race with little previous form to go on. The ratings speak for themselves on this one, we should not look outside these two in order to try and predict the front runner. However, Misty Morn has a rag’s chance and is rated just as likely to start slowly. Excel Bolt has one run to his name and is also the favourite for the race. Not much margin for an in-running play, with the price already at 2.12 on Betfair. However, if Excel Bolt breaks from the front over 5 furlongs at Musselburgh, he will take all the beating. We’ve left this to last, because these ratings are not the strongest. Basically the field is full of high class sprinters, most of whom are capable of breaking well. However, there are some nice prices on our top two, so whilst it could not be a strong fancy, Glamorous Spirit also has a hitherto spotless lagger record, and is therefore worthy of further consideration at 38.0 at the time of writing.